Cross section of carbon fiber composite sample modified by our product for Ultra Lightweighting. Ultra Lightweighting, pound-for-pound the most efficient lightweighting measure in the world. Ultra Lightweighting – the performance enhancement of lightweighting materials – is made possible by our product, the patented MNTFs Nanoparticle Additive, which is a high-performance modifier of material properties. Materials with performance enhancement generated by our product allows for a reduction in required material thickness of structures without compromising mechanical properties. • Weight savings – Our product allows for weight savings of 40% of the carbon fiber composite parts or a total of 28 tons, which equals cost savings of $8.7m. • Fuel consumption – Our product allows for an improvement in fuel consumption by 20% or 10+ tons of fuel for a single Atlantic crossing, which equals cost savings of $10m over the life of the aircraft. • CO2 emissions – Our product allows for a reduction in CO2 emissions by 20% or 30+ tons for a single Atlantic crossing. • Range – Our product improves range flexibility by 20% or 2,800 km, thereby increasing the number of possible non-stop destinations around the world. • Aircraft lightning protection – Unmodified carbon fiber composites cannot mitigate the potentially damaging electromagnetic effects from a lightning strike. The most frequently selected solution to this problem is to introduce metals back into the aircraft. The metal mesh and expanded foil added to the composite structure layup for this purpose are negating any lightweighting measures and don’t contribute to structural strength. Our solution is to make sure the airframe consists of at least 2.5% of carbon fiber composite enhanced with our product as it then serves as an electrical shield around the structure that protects against lightning strikes and at the same time contributes to structural strength. 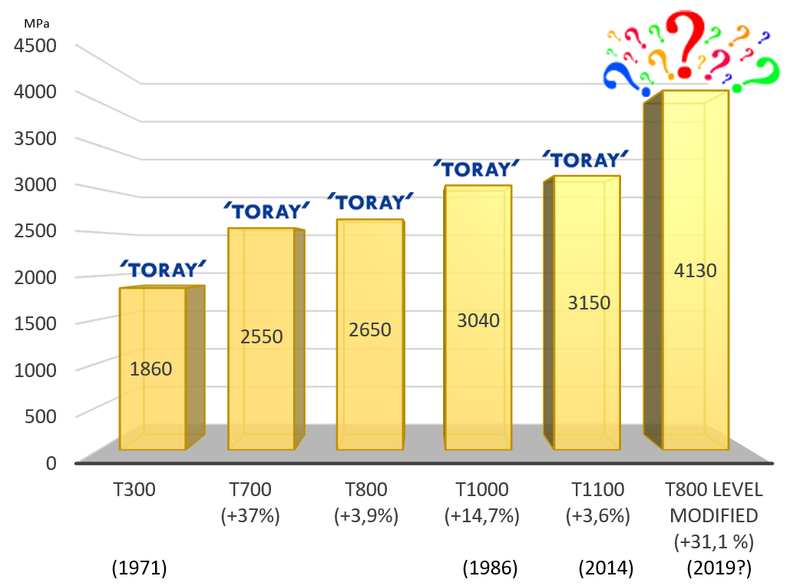 Any carbon fiber manufacturer with T800-level carbon fiber could with the help of our product surpass the current world leader in carbon fiber composites, Toray of Japan, by more than 30% or nearly 1,000 MPa, which will be the biggest leap in the evolution of carbon fiber composites in over 30 years. 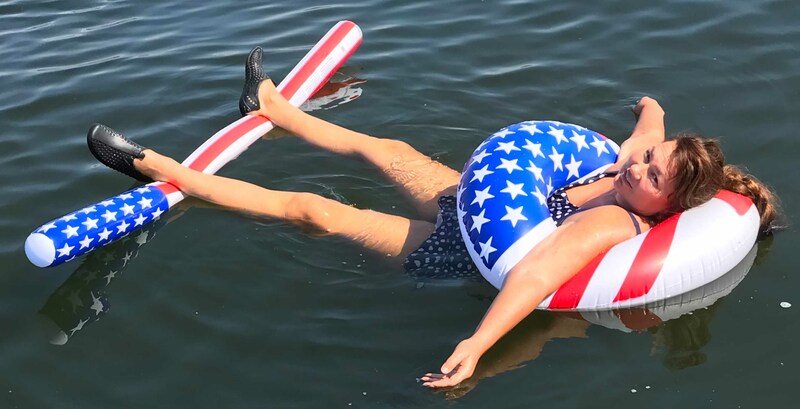 Torus vs Tube: Semi-scientific demonstration of the lifebouy-shape of the MNTFs nanoparticles that provide a micro-mechanical flotation device-style interlocking adding to the degree of efficiency as a modifier of composite properties as opposed to the detrimental sliding of the atomically smooth walls of the CNTs against the macromolecules of the surrounding polymer matrix, which eventually will cause stress concentration and crack initiation. Which one would you choose if your life depended on it? Competing technologies in the mechanical property modifiers of carbon fiber composites based on polymer matrices segment of the plastics additives industry are mainly based on Carbon Nanotubes (CNTs) and Graphene. CNTs and Graphene are both amazing materials with incredible properties – in their original pristine form. However, CNTs have been used as an additive in tens of thousands of attempts to modify mechanical properties of carbon fiber composites and Graphene is still only at the beginning of its journey from material to technology. 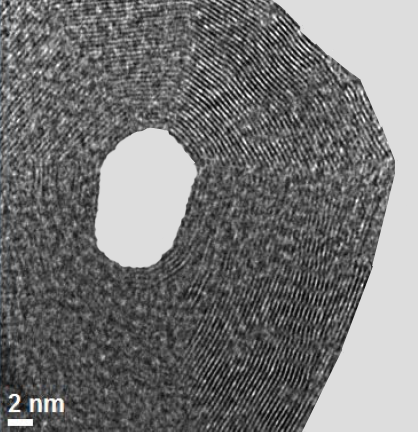 MNTF (Multi-layer carbon nanoparticle of toroid form). 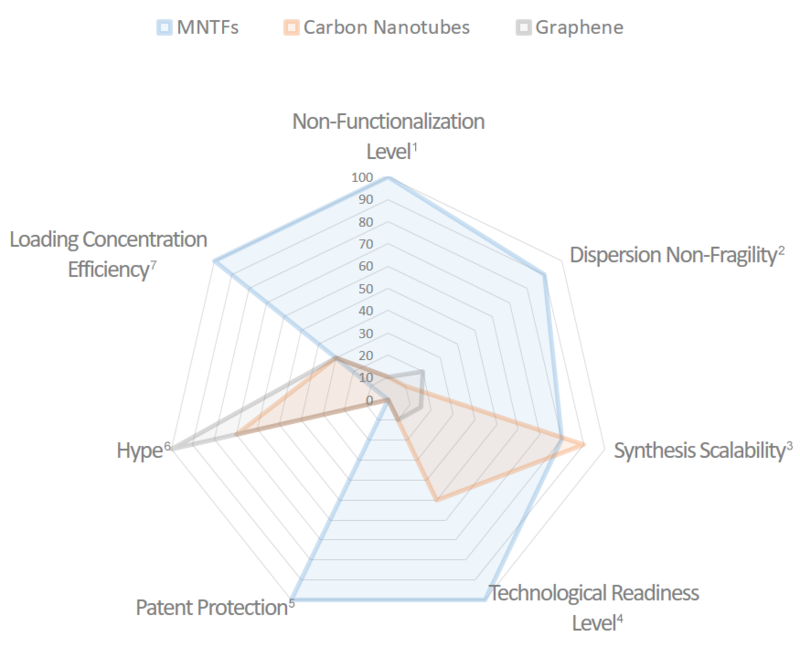 The MNTFs radar chart total of 570 outscores the heavily hyped nanomaterials CNTs (250) and Graphene (185). 1. The unique physical properties and topology of the MNTFs Nanoparticle eliminates the need for surface modification (functionalization) for composite matrix integration. 2. MNTFs are less susceptible than CNTs to fracture or deformation by the shear stresses imparted upon them in the dispersion and deagglomeration process. Also, because of the lifebouy-shape, MNTFs agglomeration when suspended in liquids is more manageable being free from the problematic ‘snake-pit’ entanglement of CNTs. 3. Scalable Graphene production is a challenge. 4. 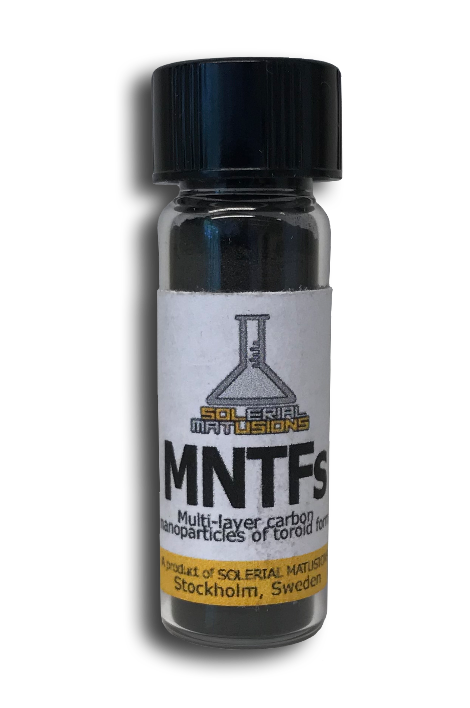 The MNTFs Nanoparticle Additive is ready for market. 5. The MNTFs Nanoparticle Additive is patented. 6. Hype constitutes the bulk of the Graphene radar chart score. 7. The loading concentration efficiency of the MNTFs Nanoparticle Additive is off the charts (0.001 – 0.01 w%), making it pound-for-pound the most efficient lightweighting measure in the world. The modification efficiency of our product is generated by powerful interaction effects originating from the presence of a closed network of delocalized π-electrons, most pronounced at the carbon fiber/matrix interface regions. The interaction effects create conditions for giant resonances in electromagnetic fields with an amplification factor of up to several orders of magnitude (3×10^4) which triggers an interface control phenomenon that is modifying and redirecting van der Waals interactions. Polymerization and crystal formation processes in the inorganic systems of the carbon fiber composite is affected by the modified van der Waals-forces as a 10 microns thick interfacial layer of perpendicularly oriented polymers is formed. 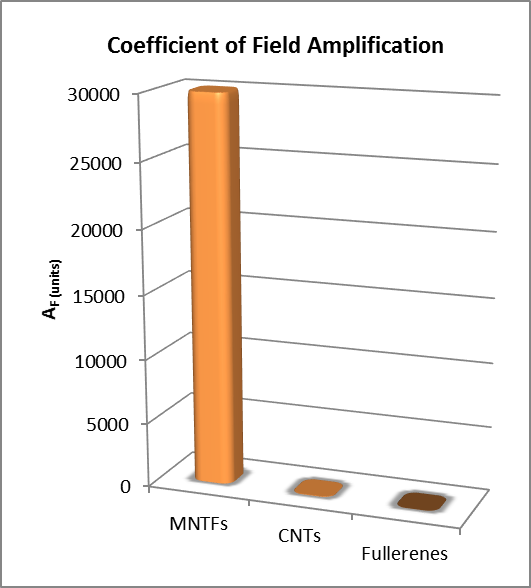 MNTFs nanoparticles exhibits a giant amplification of the intensity of both variable and static electromagnetic fields on the surface. The interfacial layer improves the level of elastic deformation, binds free energy, contributes to overall system stability and enables stress transfer and dissipation for increased resistance to external loading. Our product has the highest loading concentration efficiency in the additive industry (0.001 – 0.01 w%), and is not application- or system-intrusive, meaning it can seamlessly integrate into any existing manufacturing process with minimal negative impact on matrix viscosity and curing schedules. • Tensile strength of carbon fiber composite is improved by 40%. • SP Technical Research Institute of Sweden has conducted independent tests of the compression module on a component made of carbon fiber composite modified by our product, which has verified a performance enhancement of over 40% compared to Japanese world-leading carbon fiber manufacturer Toray. • Abrasive wear resistance in bronze is improved by 500%. • Chemical resistance to nuclear waste in borosilicate glass is improved by 400%. Our product is produced from recycled residue products of Carbon Nanotube production, has the lowest loading concentration in the additive industry, and allows ultra lightweighting through reduction of material thickness requirements, which in turn enables reduction of CO2 emissions in the atmosphere. The production process reduces the use of raw materials, which means the Earth’s limited resources is used in a sustainable manner while minimizing environmental impact. The product thus has the potential to contribute to an environmentally sustainable society according to at least the following global sustainability goals in the UN Development Program UNDP by 2030: i) to achieve the sustainable management and efficient use of natural resources. ; ii) to substantially reduce waste generation through prevention, reduction, recycling and reuse. ; and iii) to strengthen resilience and adaptive capacity to climate-related hazards and natural disasters in all countries. If you believe that we may have some technology that could be of benefit to your company, send us an email and we'll get back to you, asap.